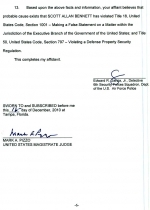 JANUARY 6--In an embarrassing security breach at the Florida military base where U.S. Central Command is headquartered, a man masqueraded as a top military aide to procure housing on the base, where he stored a large weapons cache in his home, The Smoking Gun has learned. 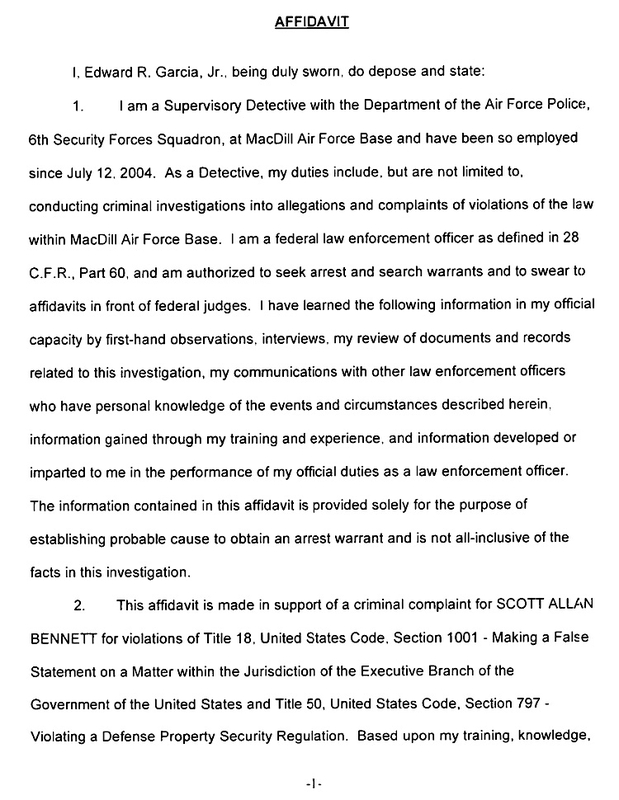 The brazen scheme was discovered last year by military investigators only after Scott Allan Bennett, 39, was arrested for drunk driving at an entrance gate to MacDill Air Force Base in Tampa. 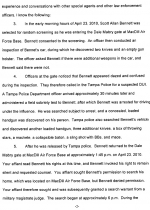 At the time of his bust, a “dazed and confused” Bennett was carrying a concealed, loaded handgun, and his vehicle contained a second loaded gun, seven knives, a machete, a collapsible baton, mace, a stun gun, ammunition, a sling shot with BBs, and a box of throwing stars, according to a Tampa Police Department report and a criminal complaint filed last month in U.S. District Court. Bennett, pictured in the mug shot at right, was released Tuesday on his own recognizance following a court hearing. Charged with making a false statement, he is scheduled for an appearance later this month at the Tampa federal courthouse. Prosecutors and military officials have, not surprisingly, done nothing to publicize the case against Bennett, the details of which were discovered by TSG. 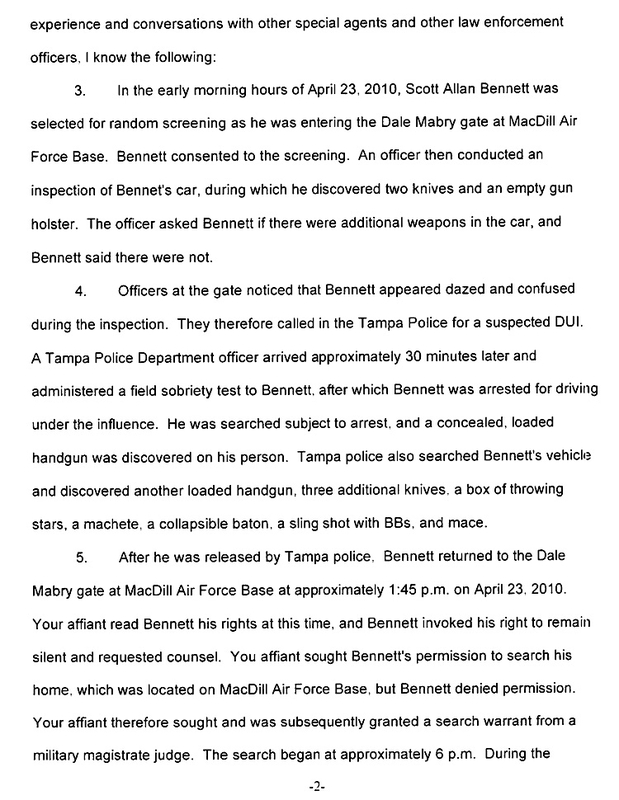 After being booked in late-April on a DUI count, Bennett returned to MacDill, where he was met at the gate by an Air Force Police investigator, who sought to question him about the weapons found in his vehicle (MacDill residents are required to register firearms and ammo with the Base Armory). 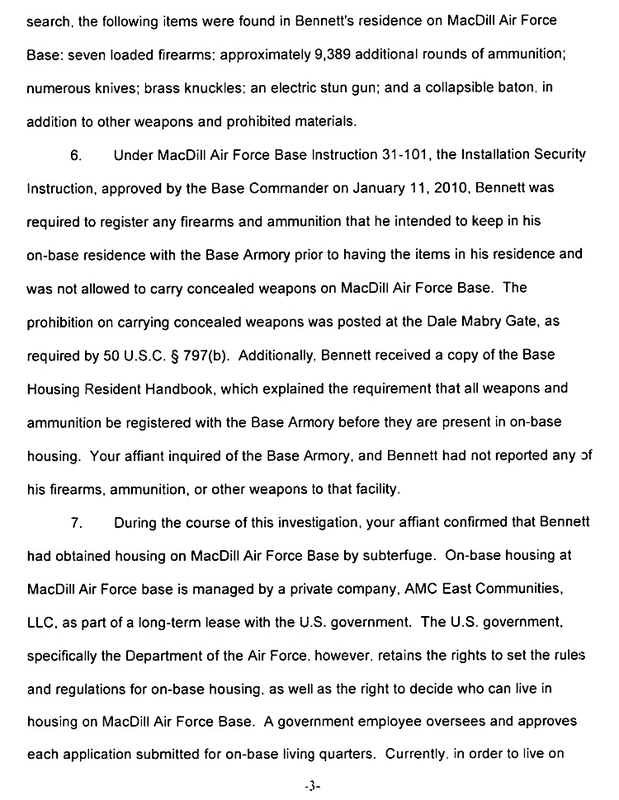 Bennett invoked his right to remain silent and denied permission to search his apartment. 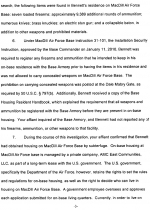 However, after a military magistrate signed a search warrant, Bennett’s home was raided. 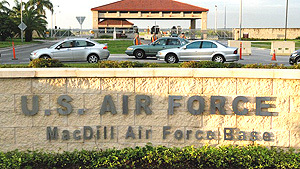 Investigators reported finding “seven loaded firearms; approximately 9389 additional rounds of ammunition; numerous knives; brass knuckles; an electric stun gun; and a collapsible baton, in addition to other weapons and prohibited materials.” None of the material had been registered with the MacDill armory. 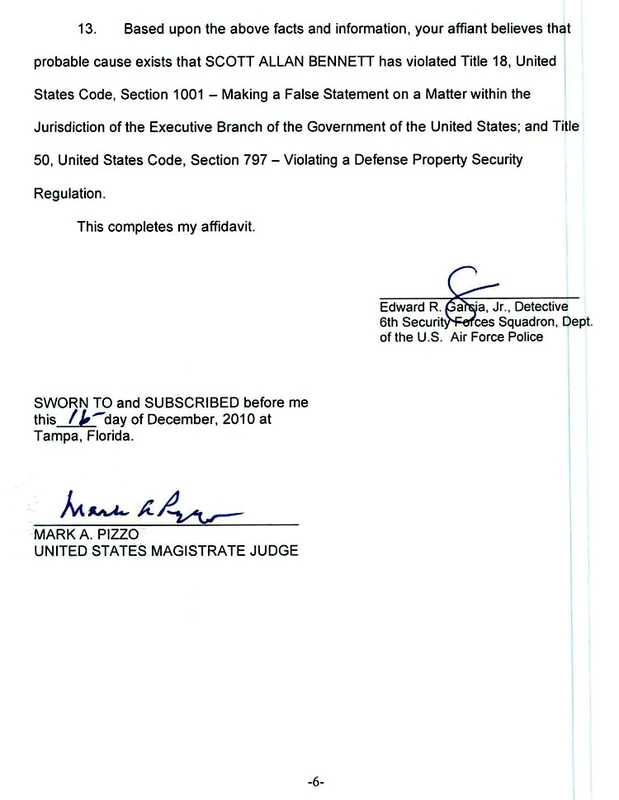 The discovery of the weapons collection triggered a military probe that concluded Bennett “had obtained housing on MacDill Air Force Base by subterfuge.” In order to live on the base, an individual “must be at least a member of the Reserve forces on active duty orders,” according to a December 16 affidavit sworn by Edward Garcia, an Air Force Police detective. 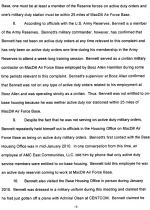 Bennett, Garcia reported, is a member of the Army Reserves, but was never on active duty while at MacDill (in fact, his active duty status has totaled one single week, while he attended a training session). 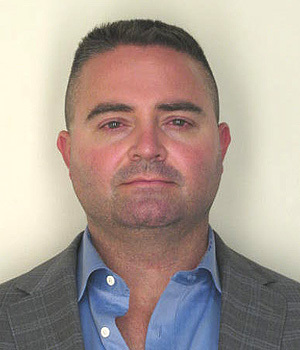 Bennett, Garcia noted, worked as a civilian contractor at MacDill, where he was employed by Booz Allen Hamilton, one of the country’s largest defense and intelligence contractors. 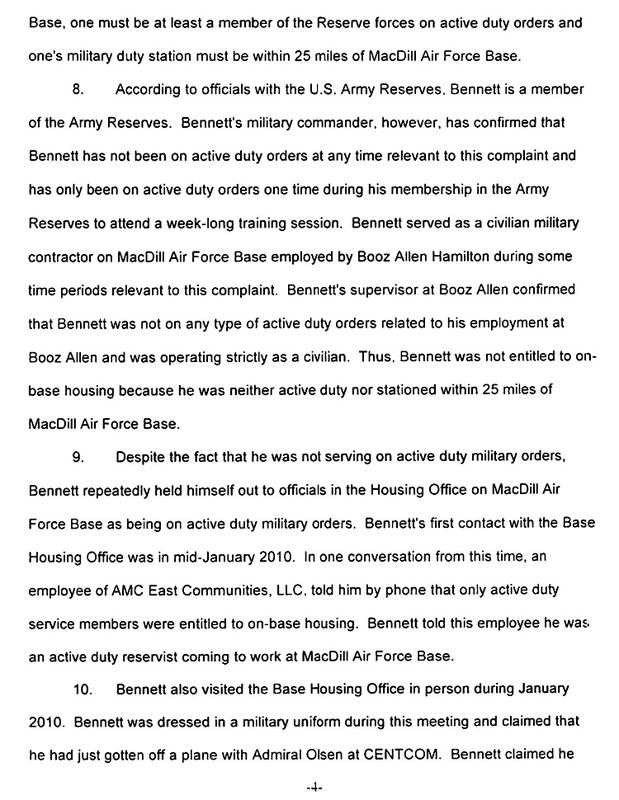 Though ineligible for base housing, Bennett “repeatedly” pretended to be on “active duty military orders.” Last January, Bennett--dressed in a military uniform--visited MacDill’s Base Housing Office and claimed to have just gotten off a plane with Admiral Eric Olson, who heads the clandestine U.S. Special Operations Command. Olson’s sprawling, 60,000-troop command is headquartered at MacDill, also home to U.S. Central Command, or CENTCOM, which is responsible for combat operations in Iraq and Afghanistan. 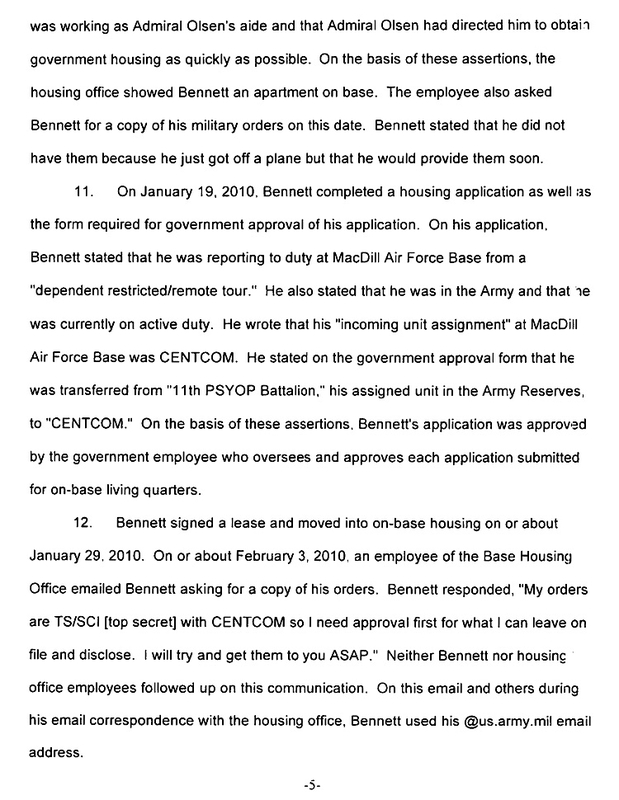 Bennett allegedly claimed that he was working as Olson’s aide and that the four-star Admiral “had directed him to obtain government housing as quickly as possible.” On a housing application, Bennett claimed to be active duty Army and reported that he had been transferred to CENTCOM from the “11th PSYOP Battalion.” On the basis of these claims, Bennett’s housing application was approved. 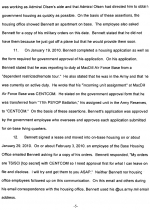 In early-February, when an employee of the Base Housing Office wrote Bennett seeking a copy of his orders, he responded that those orders were top secret with CENTCOM, “so I need approval first for what I can leave on file and disclose. I will try and get them to you ASAP.” Housing office employees, though, never bothered to follow up on their initial request seeking Bennett’s orders. Submitted by KirbyMST3K on Mon, 2011-01-17 16:26. Submitted by chicagorob1 on Fri, 2011-01-07 14:41. Submitted by Redrover on Fri, 2011-01-07 15:44. You really do make a very valid point. However, he makes a good one too. Releasing him on his own recognizance would seem pretty odd in these circumstances. As to getting busted for DUI.... it can happen to the best of them and they aren't immune to going down for it. This is a strange story, tiny b*lls notwithstanding. Submitted by Redrover on Fri, 2011-01-07 12:21. LOL! Even if that were so, you ought to pay attention. A mess hall cook will be 100% more informed than you sport. Submitted by L G F on Fri, 2011-01-07 12:08. Have you read your own article? 1. Arrest wasn't publicized 2. He's freed on his own recognizance 3. Top Secret orders (as in your little investigation, or some base detective's investigation will not find them) [by the way, that base detective and everyone involved that is in the military, including this guy, will soon be shipped off to Afghanistan... remember that.] 4. He has a cache of (based on your description) of assassin weapons, oh and 5. At his assigned home at a military base that is 6. The operations center for CENTCOM and Special Ops Com (...i.e. a major staging area for CAG (look it up) also known as Delta. (the guys that officially don't exist) and lastly 7. 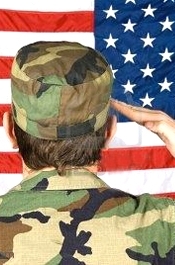 The military denies his connection to the HEAD OF SPECIAL OPERATIONS. ...hmmm, let me see. I wonder... could he possibly not be on the books on purpose? It always baffles me when civilians try to apply their ivy-league live-in-a-bubble logic to the military. Well congratulations scoop. Your story more than likely just outed a seriously deep cover Special Ops guy that does a job that requires complete secrecy. Sure, he got drunk and got caught by some fresh out of boot camp gate guard. But if you had the b~lls to do the job that a guy like this most likely does, you might go on a bender or two. Well I feel a bit less safe. Thanks Einstein! Submitted by killshot71 on Tue, 2011-01-11 12:42. Good point. Where else could such an elite assassin have picked up hard to find weapons like a slingshot and a box of throwing stars? He must be part of the covert Ninja corps. Submitted by G S on Fri, 2011-01-07 12:15. What article did you read? I didn't see anything about a "fresh out of boot camp gate guard". It always baffles me when mess hall cooks pretend they know anything about actual military matters. Submitted by Redrover on Fri, 2011-01-07 12:19. If you knew anything about the military, you'd be aware that's who is put on gate guard. A kid with a nice white pair of gloves and a telephone in case something happens. Submitted by Redrover on Fri, 2011-01-07 12:08. EXCELLENT COMMENT. I agree 100%. Submitted by G S on Fri, 2011-01-07 13:41. Neither one of you clowns knows anything. Internet toughguys are a dime a dozen. Now go do your job and cook up some chow. Submitted by Redrover on Fri, 2011-01-07 14:12. Of course not. You can run along now sparky.